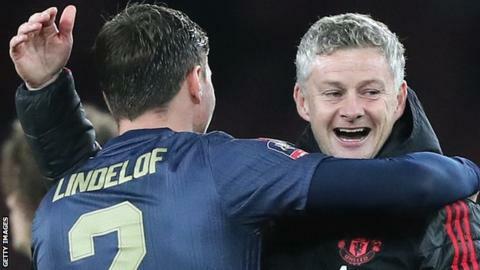 Caretaker manager Ole Gunnar Solskjaer has revived Manchester United by "unblocking the minds of the players", says his former team-mate Jordi Cruyff. United have picked up 22 points in eight games under Solskjaer after earning 26 in 17 under Jose Mourinho. "After two or three days there was a huge turnaround without any training," Cruyff told BBC Sport. "His work has been more mental, talking to the players and pressing the right buttons to get the best out of them." After starting his spell in charge with a relatively comfortable run of fixtures, United have now won away at Tottenham and at a Leicester side that earned positive results against Chelsea, Manchester City and Liverpool in the last six weeks. They are now two points off the top four, compared to being 11 adrift when Mourinho was sacked on 18 December. Solskjaer also guided his side to victory against Arsenal at Emirates Stadium in the FA Cup. Cruyff added: "The quality is there. They are good players. From the outside, he has touched their minds and put an arm around their shoulder. "When players are blocked, they cannot produce. Suddenly there is an unblock, which probably comes more from the mind because Ole had no time to turn things around based on training.